The winter season hasn’t gone so you can’t dip into your pool just yet. However, while you’re still huddled indoors, now is the time to think about pool deck renovations. After a long cold season, your pool deck needs all the love and attention it deserves. Imagine getting your pool ready just in time for summer solstice? Here are some ideas on how to transform your pool area into an outdoor sanctuary. 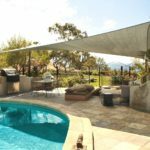 The easiest and quickest way to improve your pool area is with cost-effective additions. Some may require professional installation but that will only take a day or two. 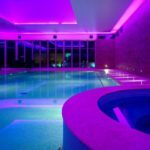 Turn your pool area into a stunning attraction at night with LED lights. Go for ones that work underwater to change the pool watercolors. Or you can line them up on the deck to increase brightness in the area. Water features are also a fun and aesthetically pleasing addition. This sounds like a very minor addition but it actually makes a big difference. Updating the pool fencing to one that looks more modern and sleek is the way to go. Outdated fencing is no way to treat a pool. 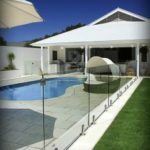 Glass fencing minus the borders are popular for its sophisticated look. Not only that, but you’ll also be able to watch if anything happens around the pool area. If your idea of a lounging area is the single plastic chaise lounge near your pool deck, it’s probably time to upgrade. Designate a lounge area where you can get creative with outdoor furniture. Add shade structures such as a gazebo or canopy so you can stay cool under the sun. If you really want to get fancy a poolside bar makes for the ultimate lounging area. This one’s the best option if your pool deck is the reason why the pool area is starting to become an eyesore. If you’re thinking about having to close your pool for a long time, don’t worry. Pool deck resurfacing is a lot faster than removing the existing pool deck and replacing it with a new one. Choose your preferred overlay and the contractor will apply it on top of the existing pool deck. Almost as easy as pie. With decorative concrete, pool area renovation is no problem at all. 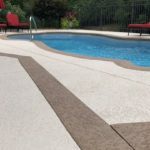 If you want to know more about pool deck resurfacing and other decorative options, visit our homepage. Read through our blogs and you’ll get all the information you need.